I would like at least 1 or more sentences per question. After I read your response we will consider unbanning you. If you are unbanned you will have to return all stolen items to a staff member if and when you return. 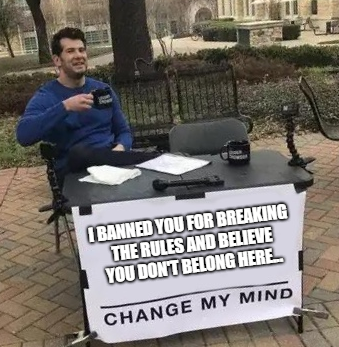 Failure to do so would result in a re-banning. 5) What have you learned from this experience? He told me don't do it again and i had to pay him back in labor cuz i took it and sold it to him and i returned the cash and i did the labor. Empire, do not post on another persons appeal. (02-26-2019, 06:35 AM)ToxicReaperXx Wrote: He told me don't do it again and i had to pay him back in labor cuz i took it and sold it to him and i returned the cash and i did the labor. Please put more effort into your answers as I will never consider one word to be a complete sentence in an appeal. Also please keep the jokes out of appeals as this is neither the time or the place for joking around.